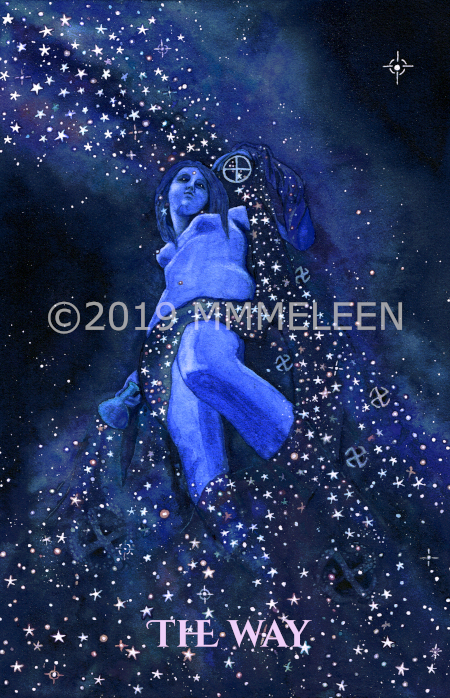 For the cross quarter holiday and Thelemic holy day, the Feast of Stars, also known as the Feast of Nuit, and Imbolc, I bring you the Dweller Between the Waters, the Daughter of the Firmament. 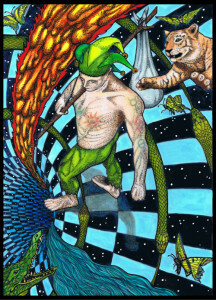 Here is The Star card from Pharos Tarot. I call this one The Way. You can see all of the cards posted to date on the Pharos page. More cards to come over the next few days, as the moon wanes and prepares to renew. Beautiful. These cards (well, The Star and the Hanged Man at least) seem to include symbolism in a a much more subtle way than your previous work. Is it a conscious decision on your part ? Yes, it was a conscious decision to incorporate the symbols more subtly. The symbolism is still there especially if one knows to look for it but the first focus is on the experience of art and design, and the colors and the watercolor medium.